It was a World Cup final for the record books. 6 goals, endless drama and two excellent teams going the distance. At the end of the day, one team goes home hoisting the trophy, while the 31 others — and indeed, the entire footballing order — conduct macro- and micro-level examinations of how to improve and emulate the success of the world’s best. So, let’s take a look at some examples where Korean football can benefit from studying and learning from this year’s World Cup finalists. The habitual disclaimer: I cannot claim to be an expert on what it is that other countries do; I can claim to be an expert on reading a bunch of articles and trying to draw some conclusions out of them for a Korean context. The first point I’d like to highlight is as “micro” as it gets — it’s tactical. A lot was made prior to the tournament about French sélectionneur Didier Deschamps struggling to find a system to turn this golden generation of French players into a dangerous unit. A lot was also made about their pre-tournament form, as in many games they seemed devoid of ideas, struggled to create and break down deep-lying defenses. On reflection, the perfect unit never existed; the French won this World Cup without ever hitting second gear. The remarkable quietude by which they won the World Cup, with half of their goals coming from set pieces, penalties and own goals, is a testament to the ability to make the opponent respect them without ever twisting the sword. It’s more relevantly a testament to their game management, seeing off opposition threats with relative ease, dictating a game’s tempo and being opportunistic in front of goal. Can anyone remember a sustained period at any point of France’s run where you went “they’re being totally dominated”? For Korea, these lessons of winning games without playing scintillating football need to be remembered in the Asian context. In truth, it’s a reminder that wouldn’t have been needed prior to the back half of the Stielike era and the Shin Tae-yong managership. Though the national team was often criticized for playing “boring football”, in Asian qualifying all that really matters at the end of the day are the three points. Back in the Asian Cup, Korea’s 2-0 win over Iraq in the semi-finals is an example of that. Two goals from set-pieces (or recycled set-pieces), controlling possession, solid shape, never breaking much of a sweat. That sort of “routine win” in Asia seems so far off for Korea in recent times – think of falling behind to Uzbekistan and Qatar at home, and then the losses to Qatar and China away, all games in which Korea never ever controlled the game’s rhythm. The ability to more or less dictate games in the way France did against Belgium in the semi-final, and Uruguay in the quarter-final, stems from three things, if we’re only looking at a structural level. Firstly, the side was more than adequately shielded in defense. Though they all had their moments, the French backline remained organized and compact, and the indefatigable N’golo Kanté obviously was of great assistance. But little things like Deschamps’ surprising decision to play Blaise Matuidi on the left wing alluded to a kind of tactical humbleness Korea will need to espouse in Asia. Even the star-power-covered France were willing to sacrifice skill for structure. With Matuidi tucking in as more of a central midfielder, allowing Griezmann to drift inside-left and sustain a simple but effective 4-2-3-1/4-3-3 hybrid. 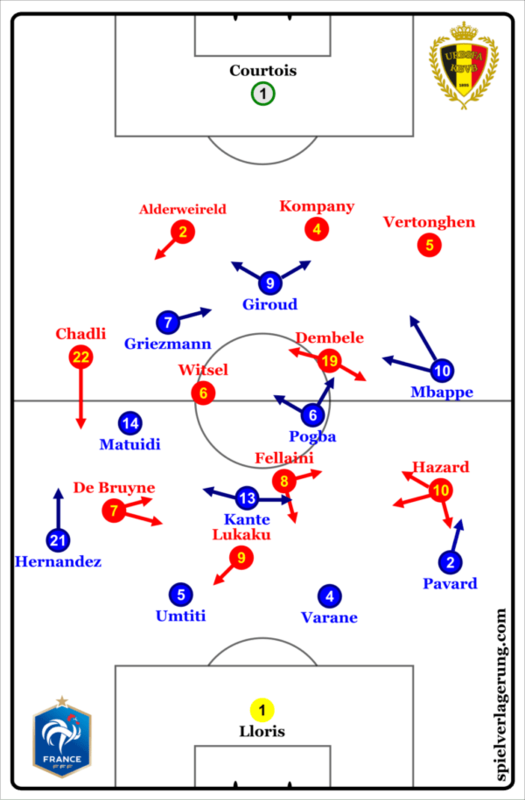 from spielverlagerung.com, demonstrating Matuidi – a central midfielder by trade – playing a hybrid role for France. Indeed, the second thing is this: Deschamps stuck to his system. Even when Matuidi was out of the quarter-final due to yellow card accumulation, he played another central midfielder – Corentin Tolisso – in a similar role. The French avoided being outnumbered in parts of the field and were well organized, from front to back. A result of becoming creatures of habit, rather than learning fresh tactical instructions off of their tablets two days before gametime (are you listening, Shin Tae-yong?). And thirdly, similar to points 1 and 2, their emphasis on realism and structure meant that players had to sacrifice for the team. Conventional logic states that Griezmann is best as a 4-2-3-1’s 10 (a withdrawn forward/second striker in a 4-4-2) while Pogba can best function and control games in a three-man midfield. This shape tried to shoehorn two stubbornly incompatible skill sets into one system, ultimately leading to both players having to play curbed roles in order for the side’s threats to be better shared. At a time when the KFA claims they want a “new Korean philosophy” with high-pressing, high-energy and high-tempo football, all three of these lessons are very pertinent. The utopian ideal of a high-pressing, energetic team in the era of Son Heung-min, Hwang Hee-chan and Lee Seung-woo is definitely a goal to strive for. However, the great World Cup-winning Brazilian side of 2002, as well as other legendary Brazilian teams succeeded only because there was a framework within which star players could intertwine and excel — because the chaos was organized, says reputed tactical analyst Michael Cox. The misconception amongst the British media is that Brazil are at their best when they possess as many creative players as possible – far from it; they have always been their best when they play a relatively rigid shape defensively that allows two or three flair players to express themselves without the worry that their failings will cost the team defensively. Whoever the next Korean manager will be (if Shin leaves the job) will need to practice and preach that rule in repetition in Asia. It’s also no secret that France’s World Cup-winning team is young — clocking in at an average age of 26 years old, the third youngest in the competition. (England, incidentally, despite not “bringing football home” this time, will also have hope to threaten again soon with this young generation.) Though there are issues with how France develops its star players – Griezmann left for Spain at 13, while N’Golo Kanté was refused by dozens of French academies as a youngster – it’s no secret that France succeeded in laying the foundations for this golden generation. One of the reasons why may be the academy at Clairefontaine, often held up as a gold standard of football academies, not least because it has hosted and taught future French national team stars such as Thierry Henry, Nicolas Anelka and William Gallas, as well as current World Champions Kylian Mbappé, Alphonse Areola and Blaise Matuidi. All the coaches of the professional clubs come through Clairefontaine. Over the years we have been able to convince them of the philosophy, about what they have to find in a player. And so we have started to have this common idea across France. The “Golden Age” program in Korea is very positive, but it is regrettable that 12 and 13 year olds are not there. 13 years old is a middle school freshman’s age, but he can’t play for his school team (because of his relative youth on the team). What is he supposed to do if he can’t play football for two years? The specialized French academies such as Clairefontaine target players in specific age groups, and have preached the importance of judging a player relative to their “real age” based off of their stage of puberty, rather than the year of birth. The best players from those academies, for example, are ones that bloom late – having learnt to battle with their more physically mature peers on an early age, they became better footballers when they reach their full level of growth. Not to mention that this system of “super-academies” ensures that the best play against the best, allowing for exponential improvement of the top tier of young football prospects. The Korean system is far from conducive to that, not least because less physically developed players often don’t get the chance to play at the youth level, even if they have potential and talent. Kim Young-gwon, for example, is one of those “late bloomers”. On an interview in Radio Star (post coming out tomorrow on the KNT’s interview on the popular talk show!) he mentioned how he received no offers from any university team because of his physical deficit. Only when a coach with a keen eye took Kim under his wing to work on that side of the game did the now-revered centreback excel at university level. The critical importance of getting starting minutes, preferably at a professional level, is something the French system has figured out. Nearly every player of this French team played considerable minutes at a U-23 level; not something that can be said about Koreans. N’Golo Kanté has played over 3000 minutes in every season since he was 20, including in the French second and third tiers. Corentin Tolisso made 20 appearances as an 18 year-old in the fourth division. Thomas Lemar with nearly a combined 3000 minutes in two seasons in the French fourth and fifth tiers as a 17 and 18-year old. Instead of languishing in some phony reserves league or as a university freshman, these players were playing professional football, getting paid, and so on. Though the K League has tried to take steps to ensure that many younger players do get competitive minutes, bringing in rules guaranteeing U-23 players minutes in recent years and well as re-introducing the R-League, many issues surrounding youth development in teenage years have yet to be addressed in any capacity. It’s only natural, then, that Korea’s brightest football talents, like Lee Seung-woo, Lee Kang-in and Kim Jung-min, have developed and learned their trades abroad instead of through the K League club-oriented academy systems. If the KFA is serious about their new philosophy, words need to be met with action, and reforms to set up structures akin to what France and many other European powers are doing should be quickly implemented. Youngsters need to be taught said philosophy from a young age, the domestic league needs to trust those youngsters and bring about a broader variety in tactics, and coaches need to be well-versed to teach it. These coaches especially can’t do a Hwang Sun-hong — go to Europe on some fact-finding mission to learn about the modern game, but then return promptly to fillet the entire FC Seoul side. A new philosophy isn’t built overnight, especially not with the structural deficit the Korean game has. 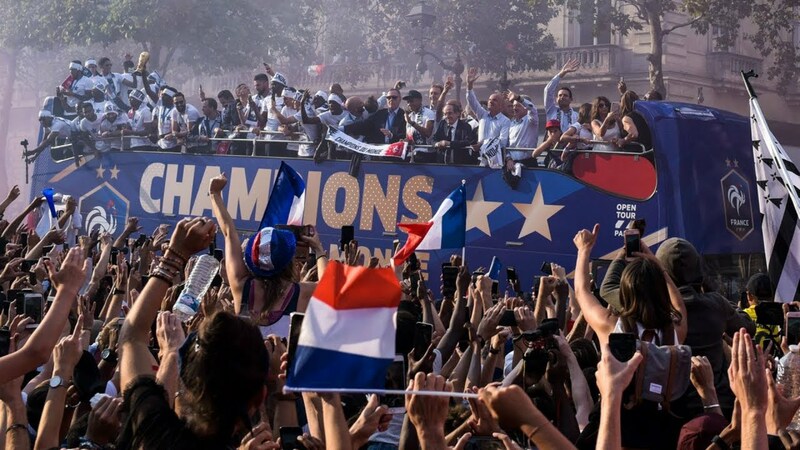 They have plenty to learn still from the World Champions on both micro and macro levels, and especially from Les Bleus’ meticulously crafted homeostasis of ideology and pragmatism. Croatia’s youth development is far less widespread and organized than France’s. In fact, the old adage of “winning covers everything” is especially relevant here. For years Croatia’s youth national teams depended heavily on the output of one club’s programme. (…) Thanks to Dinamo’s massive influence in the Croatian football federation, their youngsters have been almost automatically called up for Croatia – at one point two years ago, the under-17 team had 11 out of 11 players from Dinamo in their starting lineup. Dinamo have also had Lokomotiva – their feeder club to all intents and purposes – allowed to play in the top division against all competitive logic. Six players from the current World Cup squad have played at Lokomotiva at some point, gaining valuable first-team experience at top national club level after graduating from the academy. In a world of international football where it is difficult for teams to master complex tactical instructions like at club teams, it is increasingly important for players of a national team to have been shaped from the same hands, learned the same ways and played in similar styles as youngsters. The famous notion of “football identity” matters. 2006 Italy, 2010 Spain and 2014 Germany all shared players from a handful of strong clubs in their domestic league; 2018’s Croatia’s connections run a little but deeper but are just as meaningful. In that respect, this is one field where Korean football may have inadvertently gotten ahead of the curb. The structures for a first-division team of short-term recruits already exist. They’re called Sangju Sangmu and Asan Mugunghwa – the Army and Police clubs, who play in the K1 and K2 divisions respectively. However, the average ages of players on these squads are much older, usually around 27 years of age. There are only a few outliers – the most prominent being the 21 year-old Hwang In-beom, the former Daejeon Citizen midfielder (and Asian Games call-up) who chose to put aside the consistent number of offers he was getting from Europe in favour of doing his military service right away at Asan. Imagine more cases like this: Korea’s best domestic football recruits — at least, those not quite good enough to cut it in Europe yet or become a regular for their club team — are selected every year to Sangju or Asan for a two-year period. The KFA invests significant sums of money and replicates the Dinamo model, brings in foreign coaches and expertise to help Korea’s coaching minds implement proven imported techniques. To the question, the answer is, of course, no. And the major difference between Croatia’s reliance on Dinamo Zagreb and Korea’s hypothetical Sangju Sangmu academy is that the former is a competitive football club, while the latter is a government-owned bureaucracy. The former is run by football experts, the latter is run by political bureaucrats, KFA businessmen and army generals. Any implementation of an academy-style system would elicit heavy involvement from a KFA that has frequently demonstrated its backwardness and failure to execute what it has promised. The dire state of Croatia’s own FA, however, does provide some food for thought. The corruption is well documented and the scandals are numerous – when Luka Modric himself will go from World Cup finalist to standing trial facing counts of perjury for protecting an FA executive, there is something wrong in Croatian football. Various reports confirm that very few new stadia have been built, clubs are under-funded and under-supported, and many piches are in poor condition. And yet, amidst all of the noise, Croatian football was able to create sound at this World Cup, finishing valiant and deserved runners-up. What’s to say the KFA needs to put their fingerprints over everything? In summary, there are many differences between French and Croatian development strategies. The former relies on condensed, non-club-affiliated “super academies” to breed players, while the latter relies on the dominance of one club – Dinamo – and its feeder club – Lokomotiv – followed closely now by Hajduk Split and others. What they share is common identities within each nation, augmented by players getting significant numbers of playing minutes at a youth level. Repetition at youth level is important, just as repetition in tactical consistency and pragmatism is too. Korean football may have triumphed for 90 minutes over the 2014 World Champions, but it has a long way to go on both micro- and macro- levels on this next 4 year cycle. Some infrastructures need to be built; others converted. Some ideas need to be learnt; others simply re-learnt and remembered. All in all, there are many lessons to be learnt from the French and the Croats, and one can only pray the KFA is of the same mind. Great article! Do you know by chance what life looks like for a footballer at Sangju or Asan? Are they rather footballers or soldiers playing a bit of football? They are full time footballers at Sangju and Asan. While they have to pass certain exams to be admitted to both teams, I think they only do very basic military training at both teams. I believe they train hard and continue to live mostly like footballers, although they are paid a small wage equal to the wage of other soldiers.